Forming lifelong relationships with her patients based on trust, kindness and compassion is important to Dr. Nahal Azizkhani. That’s why she dedicates herself to understanding her patients’ needs and strives to make sure that everyone attains their healthiest, most confident smile. 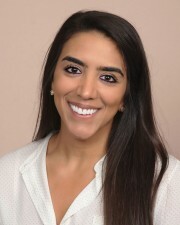 Dr. Azizkhani obtained her Bachelor of Science degree in Biology from University of Georgia in Athens, GA and her Doctor of Dental Medicine degree from LECOM School of Dental Medicine in Bradenton, FL. She strongly believes in the value of continuing education and actively seeks professional development opportunities to remain on the forefront of the latest dental practices and technology. She is a member of the American Dental Association, Florida Dental Association, West Coast District Dental Association and the Academy of General Dentistry. Dr. Azizkhani is bilingual, speaking English and Farsi. When she is away from the office, Dr. Azizkhani enjoys the outdoors, traveling and cheering for the Georgia Bulldogs.